The ill starred Arbella Stuart was born in 1575, the only child of Charles Stuart, Earl of Lennox and Elizabeth Cavendish the daughter of Sir William Cavendish and the formidable Elizabeth Talbot, Countess of Shrewsbury, known as Bess of Hardwick. In common with King James I and VI she was a grandchild of Matthew Stewart, 4th Earl of Lennox and Lady Margaret Douglas, who was, in turn, the daughter of Archibald Douglas, 6th Earl of Angus and Margaret Tudor. Arbella was therefore a great great granddaughter of King Henry VII and Elizabeth of York. Arbella's paternal grandparents, the 4th Earl of Lennox and Margaret Douglas, had two sons, Arbella's father Charles was the younger of the brothers, his older brother, Henry Stuart, Lord Darnley, became the second husband of Mary, Queen of Scots, and the father of King James I.
Arbella was baptized in the village church at Edensor on her grandmother's Chatsworth estate. Her father Charles Stuart, never in robust health, died in 1576 when she was still in infancy. 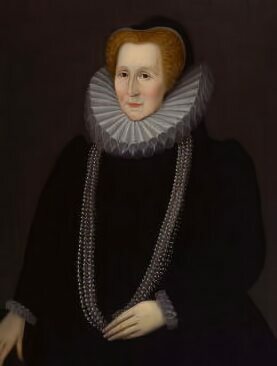 She was then brought up by her mother Elizabeth Cavendish, who was forced to live with her own mother, Bess of Hardwick, for financial reasons. Her paternal grandmother, Lady Margaret Douglas, died in 1578, leaving her a casket of jewels, the countess' English estates were seized by the crown and Queen Elizabeth declared Arbella to be under her protection. On the death of her mother in 1572, when Arbella was seven years old, she became the ward of her grandmother, Bess of Hardwick. During most of her childhood she lived in the protective isolation of Hardwick Hall in Derbyshire with her grandmother, who had married George Talbot, 6th Earl of Shrewsbury, her fourth husband, in 1568. Arbella was considered as one of the candidates to succeed her first cousin twice removed, Queen Elizabeth I, the Queen herself had indicated that Arbella might be named her heir and Bess brought Arbella up under the belief that her granddaughter was destined to become the next Queen of England. Arbella was treated as royalty by Bess' servants who were instructed to address her as 'Your Highness'. Bess of Hardwick (pictured right) had engineered the marriage of her daughter Elizabeth Cavendish to Charles Stuart, since the consent of Elizabeth I was not solicited or obtained the marriage was considered potentially an act of treason. As a consequence, the Countess of Lennox was committed to the Tower of London by an outraged Elizabeth I and Bess was ordered to face an official inquiry, she astutely ignored the Queen's summons. She knew that any children of the marriage would have a strong claim to the English throne. Thus, Arbella Stuart was a pawn in her grandmother's ambitious plans even before she was born. Bess wished to discredit Arbella's aunt Mary, Queen of Scots, in captivity in England, to advance Arbella's claim to the throne. 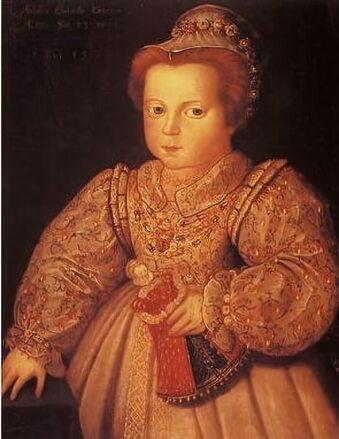 Queen Mary herself, separated from her son James while still in his infancy, spent a great deal of time with the child and became extremely fond of her. When she discovered Bess's plans for Arabella to inherit the throne, the relationship between the two women became embittered. 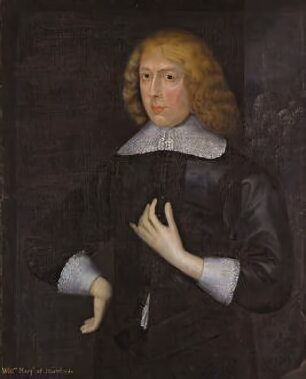 The ambitious Bess arranged the betrothal of Arbella to Robert, Lord Denbigh, the two year old son of the Earl of Leicester and Lettice Knollys. The Queen was furious at this secret alliance but Lord Denbigh died the following year and the plan came to nothing. During the summer of 1587, Arabella stayed in London with Mary Talbot at Shrewsbury House. In the August of that year, at the age of twelve, she was invited to court and dined with the Queen, she returned to court in 1588. Bess of Hardwick was to became one of the richest women in England, second only to the Queen herself. She was at first kind to her granddaughter but their relationship eventually deteriorated as Arbella felt so restricted by Bess that she felt like a prisoner. Between the end of 1592 and the spring of 1593, the influential Cecils - Elizabeth's Lord Treasurer, Lord Burghley, and his son, Secretary of State Sir Robert Cecil, turned their attention toward Arbella's cousin James VI of Scotland, whom they regarded as a preferable successor. Continuing her education into her twenties, Arbella studied several languages and could play the lute, viol and virginals. In 1588, it was proposed by James VI that Ludovic Stuart, 2nd Duke of Lennox, should marry Arbella, but nothing came of this suggestion. In the closing months of Elizabeth's reign, Arbella incurred the Queen's displeasure through reports that she intended to marry Edward Seymour, a member of the prominent Seymour family. This was reported to the Queen by the supposed groom's grandfather, Edward Seymour, 1st Earl of Hertford. 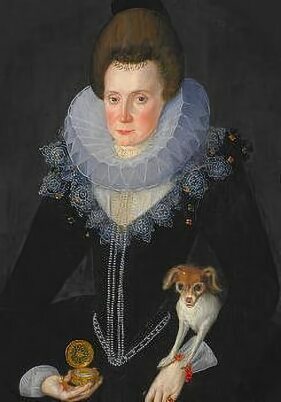 Arbella, however, interviewed about her plans in the Long Gallery of Hardwick Hall, Derbyshire, in 1603, denied having any intention of marrying without the Queen's permission. Bess asked the Queen for her grand-daughter be placed elsewhere to learn to be more considerate or to bestow her in marriage. The Queen, however, wished her to remain at Hardwick where her actions could be watched. Bess retorted that she could not guarantee Arbella's behaviour. The situation between the two women became so fraught that Arbella refused to eat until she was removed from Hardwick. The unhappy Arbella wrote many incoherent letters to the Queen's agent and it was concluded that she was insane. It has been theorised that she was suffering from an attack of porphyria, the genetic disease of George III, which causes episodes of madness, verbal incontinence and wine-coloured urine, both Mary Queen of Scots and her son James are also suspected to have suffered from bouts of the disease. Bess was asked to prevent the letters, resulting in angry scenes as the relationship between the two women continued to deteriorate. The Queen eventually sent Arabella to West Park in Bedfordshire, the house of the Earl of Kent. In 1603, after James's succeeded Queen Elizabeth to England's throne, he initially treated Arbella with kindness. Arbella was invited to court and experienced genuine affection for the first time from her cousin James' family. Arbella and the new Queen, Anne of Denmark, became good friends and Arbella was to grow very fond of James and Anne's young son, Prince Henry. A plot known as the Main Plot, devised by Arbella's cousin, Lord Cobham, and Sir Walter Raleigh, conspired to overthrow James and place Arbella on the throne. When she was invited to participate by agreeing in writing to Philip III of Spain, however, she immediately reported it to the authorities. Due to her place in the line of succession, James was not in a hurry to make arrangements for Arbella's marriage. She was still a single woman at thirty-five when, in 1610, then fourth in line to the throne, she planned to marry William Seymour, (pictured below left) then Lord Beauchamp, who later succeeded as 2nd Duke of Somerset, an action which resulted in Bess cutting Arbella from her will. 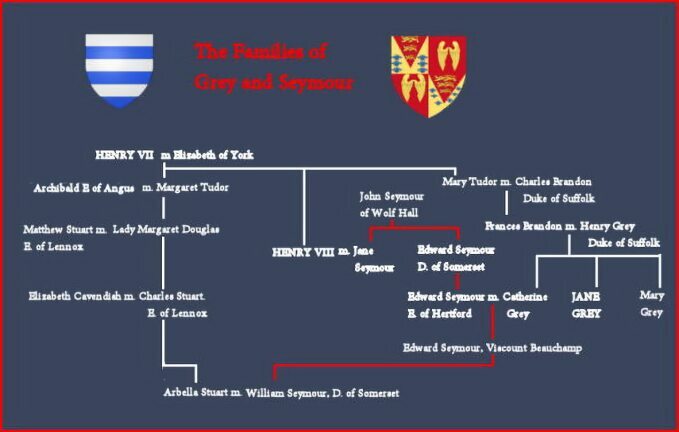 William Seymour himself had a claim to throne, being the grandson of Lady Catherine Grey, a younger sister of Lady Jane Grey and a granddaughter of Mary Tudor, younger sister of King Henry VIII and Arbella's ancestor, Margaret Tudor. James, disliked this "combination of titles", the couple at first denied that any arrangement existed between them, they were summoned before the Privy Council, where Seymour declared that he would never marry Arbella without the king's consent. Bess died at the age of eighty at Hardwick Hall in 1608. The couple later married in secret on 22 June 1610 at Greenwich Palace without her cousin the king's permission, King James, who saw the marriage, which combined their claims, as a threat, reacted by imprisoning them both, Arbella in Sir Thomas Perry's house in Lambeth and Seymour in the Tower of London. The couple retained some liberty during their imprisonment and some of Arbella's letters to her husband and to the King during this period survive. When James learned of her letters to Seymour, however, he ordered Arbella's transfer to the custody of William James, Bishop of Durham. Arbella claimed to be ill, so her departure for Durham was delayed. The couple used that delay to plan their escape. Arbella dressed as a man and escaped to Lee in Kent, but Seymour did not meet her there before their getaway ship was to sail for France. Seymour escaped from the Tower, but by the time he arrived at Lee, Arbella had left, so he followed on the next ship to Flanders. Arbella's ship was overtaken by King James's men just before it reached Calais in France. She was returned to England and imprisoned in the Queen's House in the Tower of London. When Arbella fell ill in the tower in 1614, it was suspected she was faking illness either in order to escape or to evoke sympathy. However, she refused both food and medical attention and was said by some to be delusional towards the end, believing William was coming to rescue her. She never saw her husband again and died in the Tower on 25 September 1615 from illnesses exacerbated by her refusal to eat. A post-mortem was carried out to rule out poisoning. It found that she had died slowly of starvation. Arbella was buried in Westminster Abbey on 29 September 1615. In the nineteenth century, during a search for the tomb of James I, Arbella's lead coffin was found in the vault of Mary, Queen of Scots, placed directly on top of that of the Scots queen.